Based on community efforts a new version of the Entourage Pocket Edge firmware was released today. 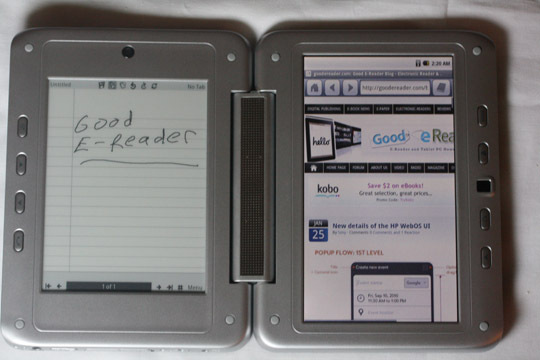 The firmware update titled 2.2 gives users many new features to get the most of your e-reader device! New features for the Pocket Edge include the Google Android Market, Google Maps, Google Talk, Voice Search! The developers have stated this firmware has been tested and should not destroy your unit, but great care is always needed when you install community based firmware. They also mentioned that the e-Ink based applications will not be bothered at all by this update. If you are feeling frisky you can download the new firmware HERE. OK, I downloaded it. Now what do I do? How do I get it onto my dualbook? Curious? Is it based the flash enabled android 2.2 or 2.3?